Discuss the prevalence of tooth loss among adults, and challenges inherent to dental implant therapy. Explain common techniques for alveolar ridge preservation following extractions, as well as the advantages and disadvantages of various open-membrane techniques for maintaining adequate dimension. List some of the resorbable and nonresorbable barrier membrane materials used in ridge preservation procedures. While the benefits of ridge preservation have been clearly demonstrated,10,14 many practitioners do not attempt these procedures after extractions. Typically, alveolar ridge preservation techniques involve the use of various combinations of bone graft materials and/or barrier membranes, with a goal of improving the quantity and quality of residual bone.6,12,15 Primary closure over barrier membranes is also typically performed by release and advancement of adjacent soft tissue. Case reports suggest that resorbable barriers, such as amnion chorion membranes (ACM),17 and nonresorbable membranes, such as dense polytetrafluroethylene (d-PTFE),18 can be left exposed in the oral cavity without compromising healing. A recent randomized clinical trial confirmed that ACM membranes can be left intentionally exposed (i.e., without primary closure) and still provide ridge dimension preservation comparable to traditional techniques.3 Sun et al19 similarly demonstrated that d-PTFE membranes can be used in an open-membrane technique. While evidence in the form of randomized clinical trials exists for only a few materials used in the open-membrane approach, each clinical situation may require a unique approach and materials to preserve the remaining alveolar ridge following minimally traumatic extractions. These techniques range from simple to complex. This paper will present four clinical cases in which the extraction socket was managed using an open-membrane approach. Clinical Presentation: A 68-year-old female presented to the graduate periodontal clinic at Oregon Health & Science University with a mandibular premolar (#21) horizontally fractured to the gingival margin. The patient’s medical history indicated no contraindications to dental treatment. She receives regular prophylaxis and her last prophylaxis was less than four weeks prior. The treatment options presented included root canal therapy, followed by a crown lengthening procedure, with subsequent core build-up and fabrication of a crown. The patient was informed of the likely poor prognosis of this option. Another option presented was extraction, with no site preservation, followed by a removable prosthesis. A third option was extraction and alveolar ridge preservation, with subsequent dental implant placement and restoration. The fourth option was to do nothing. The patient elected extraction and alveolar ridge preservation, with subsequent implant placement and restoration. Oral hygiene efforts were reinforced. FIGURES 1A through 1D.Open-membrane approach using resorbable amnion chorion membrane: #21 extraction socket (A); bone graft particles mixed with chopped-up amnion chorion membrane (B); site closed with replaced flaps and d-PTFE sutures (C); and a four-week follow-up view (D). Case Management: After informed consent was obtained and profound local anesthesia achieved, a minimally traumatic extraction was performed utilizing periotomes and forceps (Figure 1A). The socket walls were curetted and examined. The mesial and distal alveolar crests to the gingival margins measured 2 mm circumferentially. The buccal plate was intact and measured 1.0 mm thick. The decision was made to preserve the alveolar ridge with demineralized freeze-dried bone allograft (DFDBA) mixed with 1×3-mm cuts of the excess ACM (Figure 1B) packed to the alveolar crest and enclosed with an ACM. Flaps were undermined and the ACM was tucked in and stabilized with 4-0 d-PTFE sutures in a crisscross fashion (Figure 1C). Standard postoperative instructions were issued. Clinical Outcomes: Sutures were removed at the one-week follow-up appointment. Patient was followed up two weeks after the surgical procedure. The site was completely epithelialized and the gingiva appeared healed, with no signs of inflammation. This illustrates the ability of ACM to help with rapid epithelialization, wound healing and anti-inflammatory abilities. At four weeks, the site had maintained ridge width (Figure 1D). Definitive conclusions about the outcome cannot be made at this early time point, however. Indications for Use: The use of ACM for ridge preservation is primarily utilized in sockets that are fully intact and patients who may require accelerated wound healing. When performed successfully, this method will prevent rapid bone remodeling and adequately preserve the alveolar ridge for future implant placement. Clinical Presentation: A 73-year-old female presented with mild discomfort in the area of tooth #9. Her history indicated no medical conditions that would preclude treatment. Clinical and radiographic exams revealed #9 with periapical radiolucency, Class 3 mobility, and that it had undergone pathologic tooth migration. The tooth’s periodontal prognosis was deemed hopeless. Considering that alternative treatments would fail to improve the prognosis, extraction was recommended, and the patient agreed. Replacement options included a removable partial denture, fixed dental prosthesis, an implant-supported restoration, or to do nothing. The patient chose an implant-supported restoration. FIGURES 2A through 2D. Open-membrane approach using nonresorbable d-PTFE membrane: socket after extraction of #9 showing facial dehiscence after buccal flap reflection (A); bone graft placed with use of double membrane technique with a d-PTFE membrane overlapped on another titanium-reinforced d-PTFE membrane (B); site closed with replaced flaps and d-PTFE sutures (C); and a 22-week follow-up view showing healing and gains in ridge width (D). Case Management: Informed consent was reviewed with the patient, along with discussions of the risks/benefits/alternatives for the procedure. Vitals were recorded and were within normal limits. Anesthesia was obtained using local infiltration with 36 mg of 2% lidocaine with 1:100000 epinephrine. Tooth #9 was extracted with minimal trauma, but upon extraction a 9-mm dehiscence was noted (Figure 2A). The decision was made to utilize a titanium-reinforced d-PTFE membrane to reconstruct the facial aspect of #9, with an overlapping d-PTFE membrane over the alveolar crest to contain the DFDBA (Figure 2B). The clinician used 4-0 d-PTFE crisscross and interrupted sutures over the membranes to secure the DFDBA and membranes (Figure 2C). Standard postoperative instructions were issued. Clinical Outcomes: The patient was followed up at one week, at which time the site appeared to be healing well. While some inflammation was noted, the sutures were in place (with mild plaque buildup). The sutures were removed at the two-week follow-up. At four weeks, the site appeared healed, with some mild redness noted on the proximal aspects of the membrane. 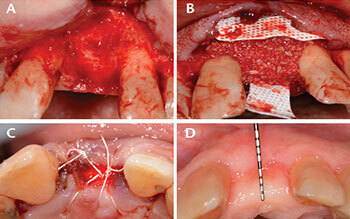 At the eight-week follow-up, the d-PTFE membrane placed over the alveolar crest was retrieved. The titanium-reinforced d-PTFE membrane was retrieved at 16 weeks. However, implant placement was not attempted at this time to allow further maturation of the bone graft. At 22 weeks, the site appeared completely healed, with a gain in horizontal ridge dimensions (Figure 2D). With the use of d-PTFE membranes, it is ideal to leave the membrane for six weeks or longer to ensure good turnover of bone. Earlier loss of membrane has the potential for loss of non-turned-over bone graft particles from the site. Indications for Use: This technique is indicated when dehiscence is present and/or dimensional stability is necessary. FIGURES 3A through 3C. Open-membrane approach using resorbable cross-linked collagen membrane in the #19 extraction socket: bone graft particles and collagen membrane tucked into facial aspect (A); membrane secured over the graft and tucked into the lingual flap, and the site closed with replaced flaps and d-PTFE sutures (B); and one-week follow-up view (C). Case Management: The patient’s vitals were within normal limits on the day of surgery. After informed consent was obtained, local anesthetic was administered to obtain profound anesthesia. The crown was removed and the tooth was sectioned bucco-lingually to facilitate individual removal of the mesial and distal roots with luxators and elevators. After the socket walls were curetted, a full-thickness tunnel technique was performed on the buccal and lingual flaps. A cross-linked resorbable collagen membrane was tucked under the facial flap and freeze-dried bone allograft was placed to the level of the alveolar crest (Figure 3A). The membrane was secured over the graft and tucked under the lingual flap. Crisscross and interrupted sutures were used with 3-0 d-PTFE to secure the membrane (Figure 3B). Clinical Outcomes: The patient was followed up at one week, at which time the sutures were removed. While the site appeared to be healing well (Figure 3C), no conclusions can be made about the clinical outcome for this case due to the short follow-up. Indications for Use: In ridge preservation procedures, resorbable collagen membranes have been shown to provide success comparable to nonresorbable membranes. In cases with dehiscence, a resorbable collagen membrane may be preferred for soft tissue exclusion because nonresorbable membranes are typically removed as early as four to six weeks. Clinical Presentation: A 59-year-old male presented with a maxillary lateral incisor (tooth #7) horizontally fractured to the gingival margin. The tooth was deemed nonrestorable. The patient’s medical history showed no contraindications to dental treatment. After all treatment options were presented, he provided consent for an extraction with alveolar ridge preservation for future implant placement and restoration. FIGURES 4A and 4B.Open-membrane approach using an epithelialized palatal graft socket seal technique in the #7 extraction socket: thick circular soft tissue auto graft harvested from the palate (A); and the socket with bone graft particles, the wound margins deepithelialized, and the palatal graft sutured and stabilized over the bone graft (B). Case Management: The tooth was extracted with minimal trauma with a periotome and forceps, and the socket walls curetted. Immediate implant placement was attempted, but primary stability could not be achieved. The decision was made to preserve the alveolar ridge with a socket seal technique to prepare the site for implant placement at a later date. A 6×3-mm socket seal harvest (including epithelium and connective tissue) was taken palatal to the second premolar and first molar (Figure 4A). Hemostasis in the donor site was achieved with the use of a collagen plug and cyanoacrylate adhesive dressing. After DFDBA was placed in the socket to the level of the alveolar crest, a 15C surgical blade was used to induce bleeding along the interior of the gingival margin. The socket seal was placed over the bone graft and stabilized to the site with 6-0 polypropylene horizontal mattress, crisscross and interrupted sutures (Figure 4B). Clinical Outcomes: As of this writing, follow-up has been scheduled but not completed; hence, while no conclusions can be made about this case, it serves as a demonstration of this technique. 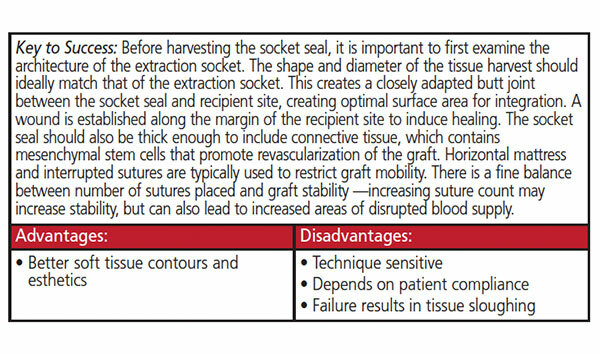 Indications for Use: The socket seal technique for ridge preservation is primarily utilized in esthetic areas to preserve the existing soft tissue contours. When performed successfully, this method facilitates soft tissue shaping around the implant restoration. Clinical Presentation: A 72-year-old female presented to the graduate periodontal clinic at Oregon Health & Science University with a maxillary premolar (tooth #5) horizontally fractured to the gingival margin. A restorative dentist deemed it nonrestorable. After review, the patient’s medical history proved noncontributory. After all treatment options were explained, she consented to an extraction with alveolar ridge preservation for future implant placement and restoration. and sutured in place with d-PTFE sutures (B); and view at 12-week follow-up (C). Case Management: A minimally traumatic extraction was performed utilizing periotomes and forceps. The socket walls were curetted and examined. The mesial and distal alveolar crests to the gingival margins measured 2 mm, and buccal and lingual alveolar crests to the gingival margins measured 3 mm. The buccal plate was intact and measured 1.5 mm thick (Figure 5A). The decision was made to preserve the alveolar ridge with demineralized freeze-dried bone allograft to the alveolar crest, and then enclosed with a collagen plug compressed to 1.5 mm. The collagen plug was stabilized with 4-0 d-PTFE sutures in a crisscross fashion (Figure 5B). Clinical Outcomes: At the 12-week follow-up, the site appeared completely healed, with minimal to no loss of ridge width (Figure 5C). Indications for Use: The collagen plug technique for ridge preservation is primarily utilized in nonesthetic areas and with a fully intact socket. When performed successfully, this method will prevent rapid bone remodeling and adequately preserve the alveolar ridge for future implant placement. The open-membrane approach, while pioneered in the 1990s, is making a resurgence in today’s practice. The techniques presented here incrementally simplify ridge preservation. Evidence for this approach exists in the form of randomized clinical trials for a limited number of materials. That noted, this technique can be expanded to include other membrane materials — although the efficacy of such use will require additional studies, including well-designed clinical trials. Gaviria L, Salcido JP, Guda T, Ong JL. Current trends in dental implants. J Korean Assoc Oral Maxillofac Surg. 2014;40:50–60. Prakasam S. Create a safety culture. Dimensions of Dental Hygiene. 2015;13(6):67–70. Hassan M, Prakasam S, Bain C, Ghoneima A, Liu, SS. A randomized split-mouth clinical trial on effectiveness of amnion-chorion membranes in alveolar ridge preservation: a clinical, radiologic, and morphometric study. Int J Oral Maxillofac Implant. 2017;32:1389–1398. Lekovic V, Camargo PM, Klokkevold PR, et al. Preservation of alveolar bone in extraction sockets using bioabsorbable membranes. J Periodontol. 1998;69:1044–1049. Schropp L, Wenzel A, Kostopoulos L, Karring T. Bone healing and soft tissue contour changes following single-tooth extraction: a clinical and radiographic 12-month prospective study. Int J Periodontics Restorative Dent. 2003;23:313–323. Iasella JM, Greenwell H, Miller RL, et al. Ridge preservation with freeze-dried bone allograft and a collagen membrane compared to extraction alone for implant site development: a clinical and histologic study in humans. J Periodontol. 2003;74:990–999. Luczyszyn SM, Papalexiou V, Novaes AB Jr, Grisi MF, Souza SL, Taba M Jr. Acellular dermal matrix and hydroxyapatite in prevention of ridge deformities after tooth extraction. Implant Dent. 2005;14:176–184. Vance GS, Greenwell H, Miller RL, Hill M, Johnston H, Scheetz JP. Comparison of an allograft in an experimental putty carrier and a bovine-derived xenograft used in ridge preservation: a clinical and histologic study in humans. Int J Oral Maxillofacial Implants. 2004;19:491–497. Chappuis V, Araújo MG, Buser D. Clinical relevance of dimensional bone and soft tissue alterations post-extraction in esthetic sites. Periodontol 2000. 2017;73:73–83. Avila-Ortiz G, Elangovan S, Kramer KW, Blanchette D, Dawson DV. Effect of alveolar ridge preservation after tooth extraction: a systematic review and meta-analysis. J Dent Res. 2014;93:950–958. Barone A, Ricci M, Tonelli P, Santini S, Covani U. Tissue changes of extraction sockets in humans: a comparison of spontaneous healing vs. ridge preservation with secondary soft tissue healing. Clin Oral Implants Res. 2010;24:1231–1237. Lekovic V, Kenney EB, Weinlaender, et al. A bone regenerative approach to alveolar ridge maintenance following tooth extraction. Report of 10 cases. J Periodontol. 1997;68:563–570. MacBeth N, Trullenque-Eriksson A, Donos N, Mardas N. Hard and soft tissue changes following alveolar ridge preservation: a systematic review. Clin Oral Implants Res. 2017;28:982–1004. Hämmerle CH, Araújo MG, Simion M; Osteology Consensus Group 2011. 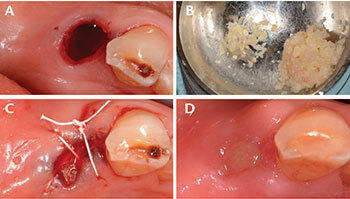 Evidence-based knowledge on the biology and treatment of extraction sockets. Clin Oral Implants Res. 2012;23(Suppl 5):80–82. Ten Heggeler J, Slot DE, Van der Weijden G. Effect of socket preservation therapies following tooth extraction in non‐molar regions in humans: a systematic review. Clin Oral Implants Res. 2011;22:779–788. Bartee BK. Evaluation of a new polytetrafluoroethylene guided tissue regeneration membrane in healing extraction sites. Compend Contin Educ Dent. 1998;19:1256–1258. Holtzclaw D, Tescano N. BioXclude placental allograft tissue membrane used in combination with bone allograft for site preservation: a case series. J Impl Adv Clin Dent. 2011;3:35–50. Barber HD, Lignelli J, Smith BM, Bartee BK. Using a dense PTFE membrane without primary closure to achieve bone and tissue regeneration. J Oral Maxillofac Surg. 2007;65:748–752. Sun DJ, Lim HC, Lee DW. Alveolar ridge preservation using an open membrane approach for sockets with bone deficiency: a randomized controlled clinical trial. Clin Implant Dent Relat Res. 2018 [Epub ahead of print]. 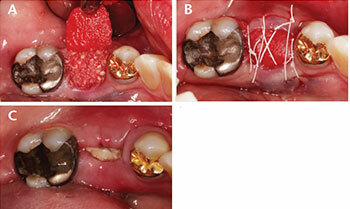 Landsberg C, Bichacho N. A modified surgical/ prosthetic approach for optimal single implant supported crown. Part I — the socket seal surgery. Pract Periodontics Aesthet Dent. 1994;6:11–17, quiz 19. Tengan KS. Prospective, comparative assessment of alveolar ridge preservation using Guidor® Easy-Graft® Classic in atrumatic extraction socket. Available at: https:/ / pdfs.semanticscholar.org/ 5b89/ a8eb959923a156a959fa6f9d99ea99b3f8fe.pdf. Accessed March 14, 2019. From Decisions in Dentistry. April 2019;5(4):42–45. Christopher A. Louie, DMD, is a graduate resident in the Department of Periodontology at the Oregon Health & Science University School of Dentistry in Portland. Clarence Lee, DDS, is a graduate resident in the Department of Periodontology at Oregon Health & Science University School of Dentistry. Sivaraman Prakasam, BDS, MSD, PhD, is an assistant professor in the Department of Periodontology at Oregon Health & Science University School of Dentistry. A diplomate of the American Board of Periodontology, he can be reached at prakasam@ohsu.edu.